The European Spallation Source will provide the scientific community with a state of the art, world leading, neutron source to be opened in 2019 in Lund, Sweden. Now, ESS is calling for your input as a potential user to participate in defining the scientific capabilities and infrastructure of ESS. 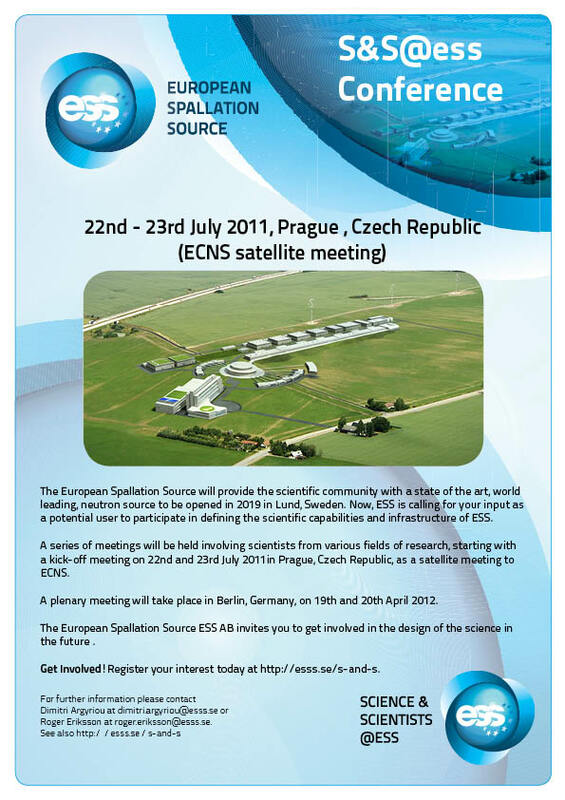 A series of meetings will be held involving scientists from various fields of research, starting with a kick-off meeting on 22nd and 23rd July 2011in Prague, Czech Republic, as a satellite meeting to ECNS. A plenary meeting will take place in Berlin, Germany, on 19th and 20th April 2012. The European Spallation Source ESS AB invites you to get involved in the design of the science in the future . Get Involved!Register your interest today at http://esss.se/s-and-s.